Friday March 25th 3:00-4:00.: Kids Sea-Themed Craft Activities Ages 4-12. Village Carousel & Arcade Party Room. Come craft with us and receive at 10% off wooden nickle for a Coastal Cone! Barefoot Boutique: Seaglass jewelry, nautical & mermaid inspired fashions. Buy one graphic tee and get the 2nd one 1/2 off! Pick up a Color Mi Vida coloring sheet, color it at home, and return it by 3/30 to enter to win a $50 gift certificate! Casa de Regalos: $2 off men’s adult mermaid t-shirts, 10% assortment of mermaid drink coasters, 10 % off mermaid gifts. Harbor Village Gallery: View the “Best of Ventura County Ocean Views, Real and Imagined” gallery show March 1-28. Harbor Village Gallery will sponsor artists in the breezeway near the Gallery on both Sundays, March 13 and Sunday, March 20, with sea-theme artworks! Come talk to the artists about their work! Hats Unlimited: 10% off Mermaid Crowns and select Captain Hats during March. Island Creations: Step into our seaside sanctuary and shop afro-caribbean inspired trends. Buy a custom designed tropical mermaid t-shirt and receive an island bracelet for FREE! Silhouettes By The Beach: Mermaid Haircut Package $25 for a haircut, deep conditioning and blow dry (a $45 value) New clients only. Please call for details and to make an appointment. (805) 650-9014. The December Store & More: Nautical and ocean-inspired gifts created by local artisans. 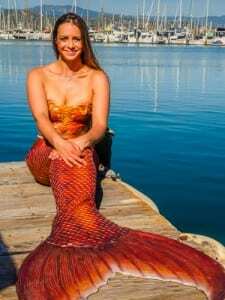 Tina O’ Brien Gallery & Studio: Mermaid painting or drawing demo every Wednesday & Friday in March from Noon-2pm. Plus everyday while supplies last… FREE mermaid seashell for kids, FREE mermaid leis for kids, FREE mermaid coloring sheets. 1/2 off 11×14 mermaid prints. Whimsical custom mermaid portraits for yourself or loved ones. Treasure Cove: Wet Wednesdays- 20% off entire store! Assorted Accessories from $20.00. Hurry- sale good March 1- March 15 (or when used stock runs out)! Ventura County Potter’s Guild: Special handmade Sea and Mermaid creations. Ventura Swimwear: Receive a sea-themed canvas swim bag with every $50 or more purchase during March. Check out the fun mermaid tails & coastal jewelry. Grab a swim suit for Spring! Coastal Cone: Try a new Mystical Mermaid Dole Whip: Delicious pineapple Dole Whip dusted with mermaid magic OR savor the all-new Mermaid Dream Sundae: Sea salt caramel topped with hot fudge, Cap N’ Crunch whip cream, fairy dust & a mermaid kiss on top. Coffee Dock & Post: Under the Sea specialty drinks. Variety of mermaid gifts. Andria’s Seafood Restaurant & Market: Free kids’ mermaid coloring sheets. Boatyard Cafe: Sip a Blue Mermaid Margarita or savor our Mermaid Omelette. Le Petit Cafe & Bakery: Homemade Seafood Crepes on Special for the month of March, a large French Crepe featuring shrimp and scallops, fresh spinach, mushrooms and a cream sauce all wrapped up with cheese baked on top. Served with fresh baguette and butter and your choice of a glass of house wine, or a draft beer or a soft drink. Just $20.00. The Greek Mediterranean Steak & Seafood: Mermaids love our calamari & fresh fish! Free kid’s coloring sheet with purchase of Kid’s menu items. The Parlor: Catch the fun with a Sea Monster Oreo Shake: Hand-scooped mint chocolate ice cream topped with fairy dust & a mermaid’s kiss. Pacific Fish Burger, Seaside Grilled Chicken Burger, and Sea Dog.